Reliable rankings are difficult to determine, but chances are Alfredo Noa Estnupiñán is one of the longest-imprisoned political prisoners currently in the Castro gulag. Noa was arrested Feb. 2, 1997, accused of "enemy propaganda," "revealing military secrets" and "counter-revolution." More than a year later, on March 2, 1998, Noa was sentenced to 23 years in prison, a sentence that was later reduced in 15 years. Noa is currently being held at the Combinado de Guantánamo provincial prison, where officials have instructed common prisoners to beat Noa -- but not in the face so it's not visible -- if he speaks out against the Castro dictatorship. 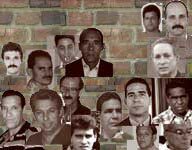 Enlisting common prisoners to attack political prisoners is a common tactic of repression in Cuban jails. Despite his many years in jail, Noa has not been forgotten by other activists in Cuba. For example, on May 9 of this year, about 20 protesters took to the streets of Guantanamo to demand the release of Noa and another political prisoner, Andry Frómeta Cuenca. The dictatorship responded by beating several of the demonstrators.